DONETSK, Ukraine -- Pro-Russia rebels shot down a Ukrainian fighter jet on Sunday, before Kiev and Moscow's top diplomats were due to hold urgent talks to defuse tensions over fighting in the east of the ex-Soviet nation. 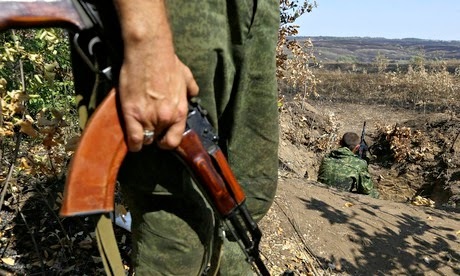 Pro-Russia rebels in eastern Ukraine. Ukraine's military said its MiG-29 warplane had been shot down as it carried out "an assignment to eliminate a large group of terrorists" in the Luhansk region. The pilot managed to parachute to safety, it said. The French president, François Hollande, called for Ukraine to show "restraint and good judgment" in its military operations, after boasts by Kiev that it had destroyed part of a small military convoy from Russia. He suggested the talks could pave the way for a face-to-face encounter between the Russian and Ukrainian heads of state. The Red Cross said its officials had arrived at an area where 300 Russian trucks were waiting, but official inspections of the cargo were yet to begin. AFP journalists later saw a group of 16 trucks head in the direction of the crossing.